Suitable for everyday carry, hiking or outdoor sports. Easy use, just bend the cable and aim at the ring hole and screw up. Ideal for hanging flashlight, key rings, pliers and other hand tools. This is High Quality Firm and Strong key chain made by SILIPAC. It's made of Stainless Steel Wire with plastic cover. No chemical smell. 4mm THICK cable is Tactile and Tough. Not the cheap knock-offs that break loose. 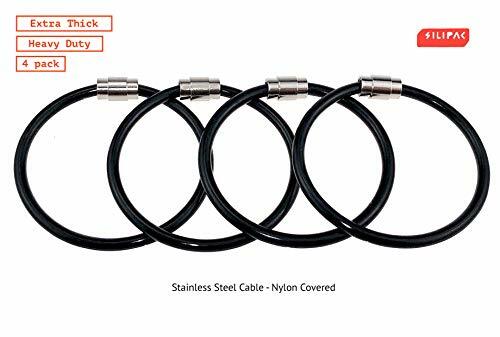 DURABLE: 4mm EXTRA-THICK&EXTRA STRONG wire cable is Tactile and Tough.2018 NEW - BEST QUALITY! MULTIFUNCTION: HIKING, FISHING, CAMPING, TRAVEL any outdoor activities or ORGANIZING YOUR KEYS, hanging flashlight, luggage tags, ID tags, pliers and other hand tools. GREAT FOR ARTS & CRAFTS PROJECTS - Key rings also make fun accessories for arts & crafts project! Decorate a painting or build a sculpture, the possibilities are endless. If you have any questions about this product by Silipac, contact us by completing and submitting the form below. If you are looking for a specif part number, please include it with your message.